Fonda Cassidy, a nurse, is from Mt. Olivet UB church in Mt. Solon, Va. She has led or participated on UB medical trips to Honduras and Sierra Leone. 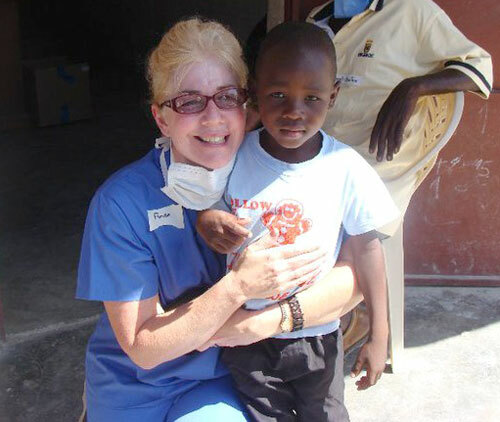 Here, she writes about going to Haiti in October with Samaritan’s Purse. 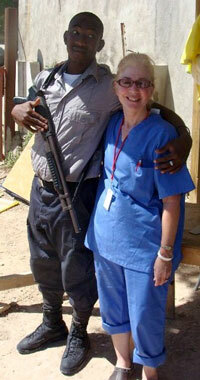 In October 2010 I left for Haiti to work with Samaritan’s Purse. I did not realize until I arrived that there was an outbreak of cholera. This is a bacteria that spreads by contact or contaminated water. None of the 5 doctors nor myself had worked anywhere where we have witnessed this. Once you see it, you truly do not forget. They came with fear frozen in their eyes, drawn up and over with incredible abdominal pain, with profuse emesis and diarrhea. What you soon realize is that the little ones and the older generation will soon die if not cared for properly. They need oral hydrating salts and/or IV solutions to replace their fluids, and an antibiotic. So we ran cholera camps where we were treating only cholera. If they did not get treatment within 12 hours, they usually died. It is so hard to see death where you are working. Sometimes we would start treating someone, but it would be too late. They would have to be taken out right away and buried. At each clinic we did a lot of teaching and had a pastor to pray with the people. I worked in 4 different locations in Haiti. One clinic took us about 2 hours to reach. Others were closer. We were able to share Christ with our patients. Personally, I was blessed to lead about 4 of my patients to the Lord. There would be follow-up by a Haitian pastor. I was able to visit 4 orphanages that were run by Samaritan’s Purse. 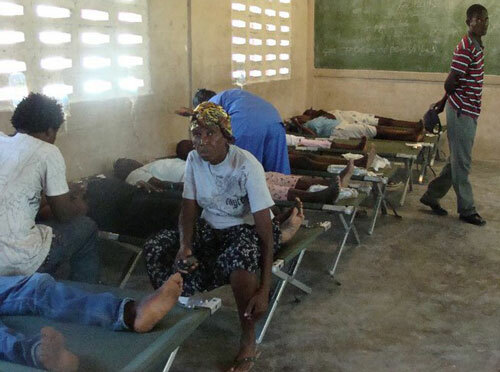 I taught in about 4 different classrooms about cholera–how it spreads and how to prevent it from happening. I will gladly return to Haiti to help in any capacity that God would want me to. We have 22 United Brethren churches in Haiti. I was able to meet with the leader, Pastor Oliam Richard. He was a very precious man. He took me to two sites in Cite Soleil where there had been two churches. They now are rubble. Both toppled in the earthquake. There are plans to rebuild. Safety and security is very important in Haiti. Each time we left the secured compound we had to radio a safety code, and when we arrived at location we also had to radio that we were at our destination. I witnessed people dying and I witnessed a person being killed by rocks as he tried to steal–the police stoned him to death. 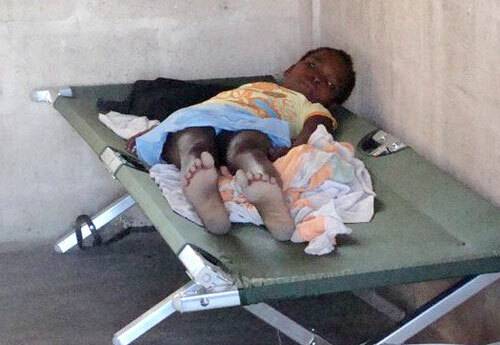 Haiti is very rough, but there are thousands of people living in that country that God loves and cares for. He has asked us to be his hands and feet in ministry. I am grateful for the opportunity to serve. Billy Simbo, bishop of Sierra Leone Conference, will return to Sierra Leone Monday night, November 22. On Saturday, November 20, he sent this positive report on his wife, Mamei, and her continued recovery after spending three months in the hospital. Mamei has gone from just making progress to actually recovering from all of the things that have happened to her over the past three months. This week, she reached several key. The first milestone came on Thursday when the speech therapist cleared Mamei to take liquids by mouth and eating solid food for the first time in over two months. Mamei must have anticipated this by faith, because last Saturday when her cousin, Julie (Beah) Williams was visiting, she told her she wanted Julie to prepare a special kind of rice for her. She told her what sauce to cook with the rice and then Julie was to add some green leaves to the rice to make it slippery. Anyway, today Julie came with the rice and Mamei ate a small portion! The first time she had eaten rice in three months. Now those of you who know us Sierra Leoneans, especially a Mende person, you know that is a long time of suffering. Her spirits are up, and her speech and thought patterns are much clearer than they were a week ago. She still gets a little confused sometimes, but she can put thoughts together and actively participate in conversations and discussions. But the biggest milestone came this afternoon. As I sat next to Mamei, she suddenly started to clap. Donna and Arek Delik are endorsed staff with Global Ministries. Members of our Hong Kong Conference, the Deliks have been serving in Poland since 1999. We have sent a number of short-term teams to assist the Deliks in their ministry. The following is a description of a current project from Arek and Donna. Those who have visited us may remember the 2 rooms we rented in a commercial building. In the last 8 years we have been using them for church ministry as well as “New Life Foundation” ministry among alcoholics. With the expanding ministries, this place no longer met our needs. In the last 3 years we have stepped up our effort of property hunting. However, most of the properties we found were either too expensive or not suitable for our purposes. Recently, Arek spotted a building that had been owned by the government that seemed perfect. We were able to purchase it at auction for $150,000 USA. We are very thankful for those individuals and churches who have promised to lend us money for this purpose. Payments will begin in December 2010. Nevertheless, we still need at least about $53,000 USD toward the purchase price, and need to fix part of the roof (which is leaking) before the cold winter hits us with a lot of snow. The building will be used for more ministries which will benefit the local community. We dream of someday providing a safe haven for children and teens to hang out, instead of causing trouble in the street. “New Life Foundation” also wants to extend its work to helping people with drug addictions, in addition to alcoholics. With a better place, we could even have a real “Coffee House” to serve hot tea and coffee to those who have nowhere to go. With a proper kitchen we can run the weekend outreach for alcoholics more often. And we want to do much more than that. Thank you for praying for our building project. We experienced the peace of God during the auction. It was a very tough bidding. A businessman was very determined, and so were we; the biding went to and for. Finally we won the auction with 430,000 zloty (about USD 150,000). It was almost 20% higher than the basic price, but we believe that it’s still a very reasonable price for this property. The building itself is 360 square meters with 22 rooms on 2600 square meters of land. Praise God that we have crossed the river Jordon safely, but we still need to fight to claim the promised land in Canaan. We will be grateful for your support for this project and appreciate if you could join us once again in prayer for this urgent need. We trust our Father in Heaven who could meet our need. If you’re interested in supporting this project, please go to the project page on the UBGlobal site for more information. The annual Winter Slam youth retreat is coming up February 4-6, 2011. This annual retreat, which has been held for about 20 years now, will take place in southwest Pennsylvania at the Laurelville Mennonite Church Center near Mount Pleasant, Pa.
You can read all about it on the UB website–schedule, speakers, musicians, how to register, etc. There are a variety of items you can download. Bring some teens from your youth group for fun and spiritual inspiration. Jennifer Blandin, Global Ministries staff in Macau, returned to the States on November 3 for an extended furlough. Beginning in January 2011, she will be available to speak to United Brethren churches and other groups about what has happened in Macau during the past three years. Jennifer also plans to complete her Masters degree by August 2011, which is the reason her furlough is being extended. 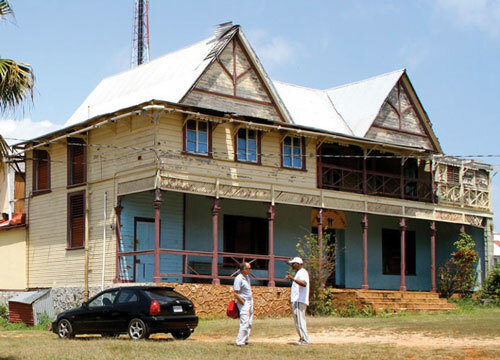 This building at Jamaica's Malvern Camp needs to be rebuilt. 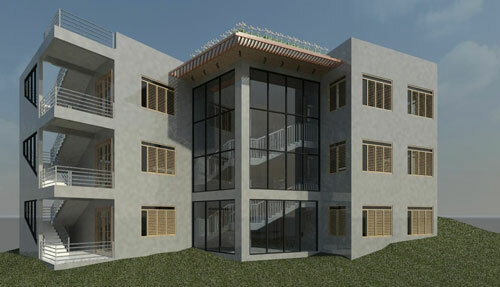 This is what the new building at Malvern Camp will look like. As already announced, a series of work teams will head to Jamaica in January and February 2011 to help rebuild the dining hall/activity center at Malvern Camp. This is a 50/50 partnership between Global Ministries and the Jamaican churches. We’re looking for team leaders and about 7-8 people per week. Cost per person will be $225 plus airfare to and from Montego Bay. Contact Donna Hollopeter for more information. Thirteen Huntington University students will be taking the plunge next week to help those in need in the Chicago area. The trip, known as Urban Plunge, is sponsored by the Joe Mertz Center for Volunteer Service on campus and will take place Nov. 19-21. Emmaus Ministries. They will participate in an Immersion Night, which is an attempt to stop male prostitution. Cornerstone Community Outreach. They will help sort through clothes for the Outreach’s “free store” where those in need may obtain clothing. A Just Harvest. They will work in the soup kitchen. “I think it will be a shock to some, uncomfortable for many, and different for all of us. I also think, however, that it will be a good learning experience,” said Dana Lancaster, a junior at HU and the student organizer of the trip. Felicia Pettigrew, a senior graphic design major, from Lampe, Mo. Jonathan Zamora, a freshman undecided major, from Chicago, Ill.
Brittany Scales, a freshman educational ministry-family and children major, from Rochester, Ind. Monica Salvo, a junior social work major, from Deerfield, Wis.
Heather Mayer, a sophomore educational ministry-family and children major, from Ossian, Ind. Margaret Kubina, a junior biology major, from Sheridan, Ind. Justin Sommer, a junior youth ministries major, from Berne, Ind. Sean Cruse, a senior animation major, from Melville, N.Y.
Catherine Rinchak, a freshman fine arts major, from Chesterton, Ind. Rebekah Lantz, a junior psychology major, from Fowlerville, Mich.
Dana Lancaster, a junior entrepreneurial/small business management major, from Hereford, Pa.
A scheduled four-day revival spontaneously expanded to an eight-day outpouring of God’s Spirit on the UB church in Fostoria, Ohio. God’s people were willing seekers around the altars each evening. The final Sunday morning service ”shook” with the Presense of God’s Spirit. The transforming power of the preached Word of God brought all of us to our knees. Jim Woodward, a member of First UB church of Findlay, Ohio, didn’t think his city was living up to its Congressional designation as Flag City USA. So he contacted the Downtown Findlay Improvement District, which bought 186 2×5-foot flags. Woodward then joined inmates from the country jail to install the flags around town in time for Veterans Day. WTOL ran an article about Woodward on its website, with an accompanying video. Woodward is a barber in Findlay. Two women from the Golden Spring UB church in Jamaica are participating in a mission trip to Zimbabe, in southern Africa, November 18 – December 4, 2010. Miss Paulette Anderson and Miss Trician Sang will be involved in teaching, teacher training, and construction at a school in Zimbabwe.They each need $3000 (US) to cover the trip expenses. The $3000 covers airfare to and from Zimbabwe, a contribution to the project, and all expenses once landed (visa, taxi fares to and from the airport, food, and lodging). You are invited to help contribute toward their expenses.